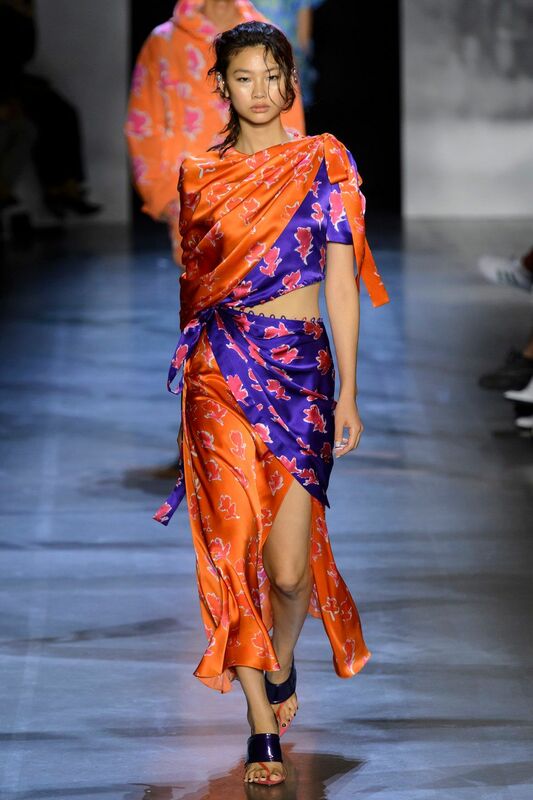 Prabal Gurung stacked his spring 2019 runway with heavy hitters, including Joan Smalls, Presley Gerber (daughter of Cindy, brother of Kaia), Duckie Thot, Winnie Harlow, Candice Huffine, Alton Mason, Marquita Pring, Adesuwa, Dara, and all three Hadid siblings (Gigi, Bella, Anwar). The models were respectively from nearly three dozen different countries, and the casting featured diversity in gender, race, and size. It was truly, warmly, inclusive. Gurung also used this season to launch menswear, presenting athletic-style garments in bright candy colors. Anwar wore a pink suit! The Nepalese-American designer was especially inspired by the southern region of Nepal. He incorporated several references to the country into the collection, including ornaments that hung off wrap skirts and takes on traditional jewelry. Our favorite look — a true stunner — was a draped dress in contrasting orange and purple fabrics, with a cut-out featuring couture-style button loops. Gurung's set was full of colorful Nepalese prayer flags criss-crossing the ceiling (the clothes reflected a similar color palette). The designer tweeted that his collection was a "cross-cultural journey that sees no borders, tied together through our ability to use color as a universal language." He used his platform to argue for a better world: Gurung wore a "Vote" t-shirt on the runway, and there was a reminder at every guest's seat. Which reminds us: New York, primaries are on the 13th!